Facilities: FCI Aliceville with adjacent minimum security satellite prison camp. NOTE: Funds cannot be sent directly to inmates. See our page on sending money to federal prisoners. Location: FCI Aliceville is located 100 miles from Birmingham, on the west side of Alabama. Background: Construction on FCI Aliceville began in 2008 and it became operational in 2013. 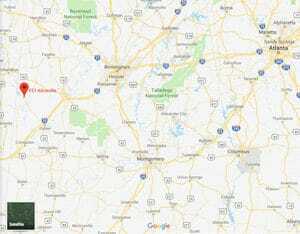 The prison is located between Aliceville and Pickensville. Notable prisoner Elaine Brown, (serving a 35 year sentence), was convicted in 2009 of stockpiling bombs, handguns, and high-powered rifles during an 8-month standoff with authorities in their attempt to apprehend her and her husband, Ed Brown, for a 2007 tax evasion charge. Housing: Inmates are housed in cells, while inmates at the camp are housed in dormitories. A Special Housing Unit (SHU) is also present, where inmates are housed in cells. Health Services: FCI Aliceville provides medical sick call services for routine, non-emergency conditions, dental sick call for dental emergencies, chronic care services, pharmacy services, prescription medications, tuberculosis testing, eye examinations once every two years, physical and periodic health examinations, and HIV testing. Emergency medical care is available 24 hours a day. Psychology Services: Inmates participate in Psychology Services A&O within a month of their arrival. Psychology Services staff work with inmates who have mental health and significant emotional and behavioral problems. Psychology Services staff also encourage inmates without such problems to engage in self-improvement activities. Inmates who need to be seen by a psychiatrist for psychotropic medications are referred through Health Services, with input from Psychology Services. Typical groups offered include drug treatment groups and trauma treatment groups. Brief counseling sessions are also available to address individual needs. The facility also offers the STAGES program for inmates with serious mental illness and personality disorders. Residential Drug Abuse Program (RDAP): FCI Aliceville and the satellite camp do not house a Residential Drug Abuse Program (RDAP). They do offer the Drug Education class and the Non-Residential Drug Abuse Program (NR-DAP). Education Services: FCI Aliceville offers literacy, GED and GED preparation classes, Spanish GED, English-as-a-Second Language (ESL), and a Special Learning Needs program. Adult Continuing Education (ACE) and parenting classes are also available. A Release Preparation Program is also offered. Inmate tutors teach skills including job searching, resume writing, budgeting, and buying a home. High school diplomas and post-secondary programs are available through paid correspondence programs. Advanced Occupational Education: FCI Aliceville does not offer any advanced occupational education programs. Vocational Training: FCI Aliceville offers vocational training programs in Carpentry and Electrical. Both facilities also offer training in MS Office. Apprenticeship: FCI Aliceville offers apprenticeships in Carpentry, Electrician, HVAC, and Plumbing. Library Services: FCI Aliceville has both a leisure and law library with hundreds of reading and reference books in English and Spanish, newspapers, magazines, legal reference materials, Bureau of Prison policies, a copy machine, and typewriters. Inmates can conduct legal research on the TRULINCS Electronic Law Library computers. UNICOR: FCI Aliceville does not house a UNICOR facility. Commissary: A $360.00 monthly spending limit is imposed. Inmates are allowed to shop once a week on a designated day. Inmates can purchase a wide variety of items, including clothing, shoes, electronics, food, sodas, ice cream, and more. Recreation Services: FCI Aliceville offers athletic and leisure time activities for the inmate population. The gymnasium, recreation yard, inside recreation areas, and hobby craft are open on a daily basis. The Recreation Department also offers a variety of games, sports, social activities, arts and hobbycrafts, wellness, and other group and individual activities. The camp has a recreation yard, a variety of games, sports, social activities, arts and hobbycrafts, wellness, and other group and individual activities.